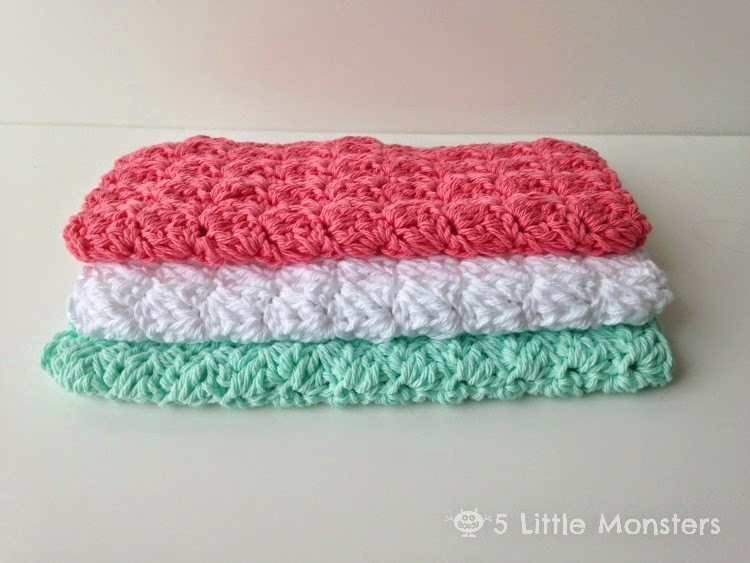 A couple of weeks ago I shared one of my favorite dishcloth patterns, the Moss Stitch Dishcloth, and today I am going to share another of my favorites. 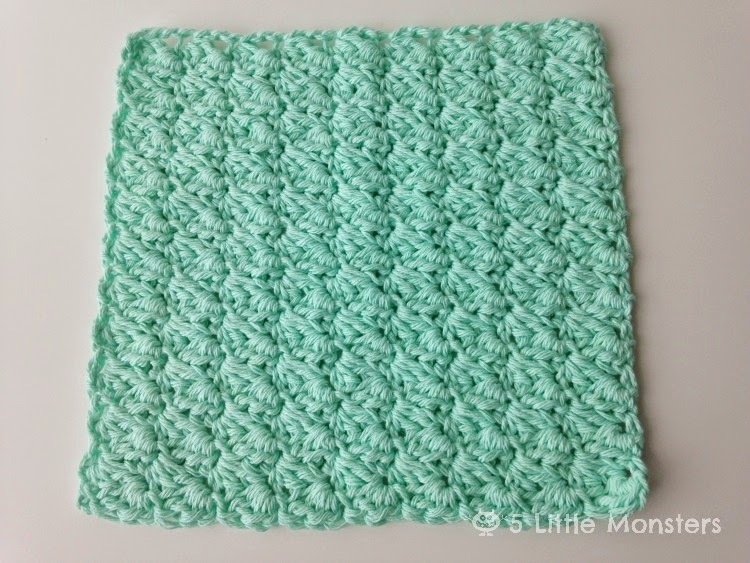 The Moss Stitch Dishcloth is great when you are wanting a quick and easy dishcloth that has a little bit of texture to it but sometimes you want something that is a little bit prettier. 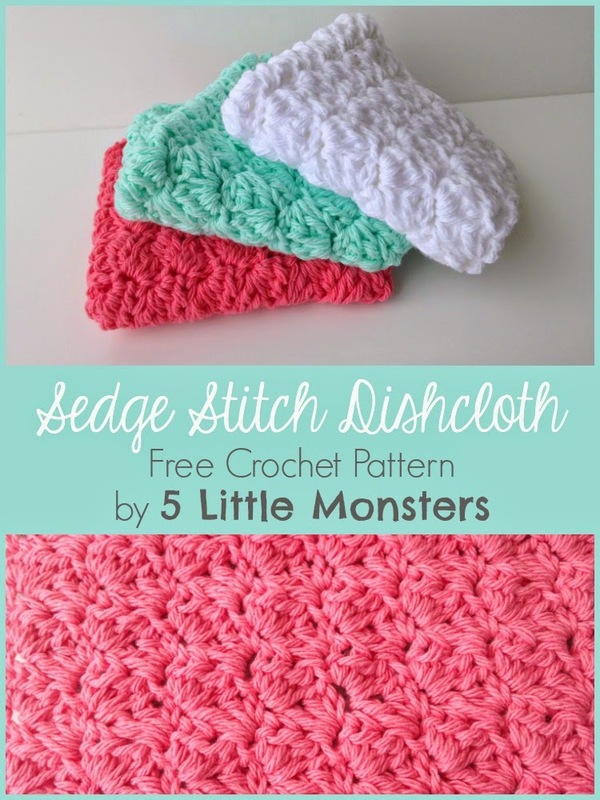 When I want a pretty dishcloth that still has a lot of texture the Sedge Stitch Dishcloth is my go-to. This is probably my very favorite stitch to use for dishcloths. 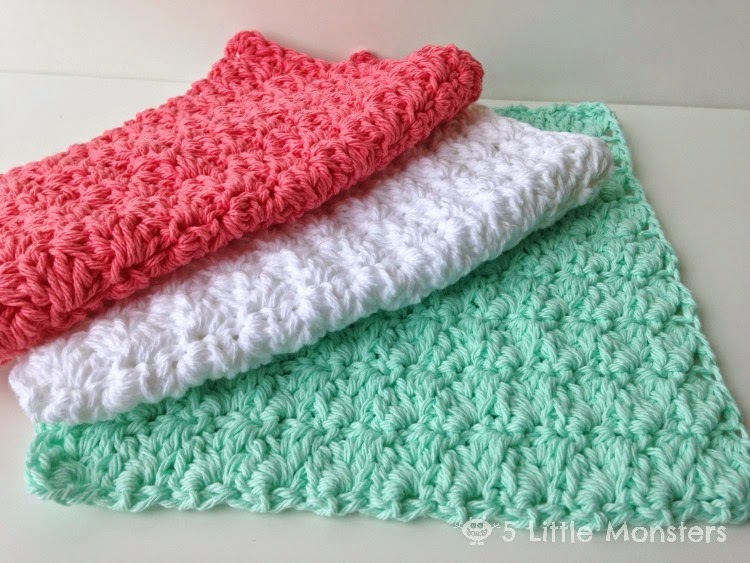 I have used this pattern to make both dishcloths and washcloths. As dishcloths I usually pair them with a bottle of dish soap. Sometimes, when I am looking for a more girly gift I pair a washcloth or two with some pretty smelling body wash or lotion. I think that this stitch works well for either type. I feel like some stitches have too utilitarian of a feel to make a good washcloth. If I am making it as a washcloth I want something with a little bit more feminine feel. With this cloth I feel like you get both texture and functionality and that pretty femininity. This cloth uses a few more stitches than the last one I posted so it is not as much of a beginner stitch but it is not hard either. 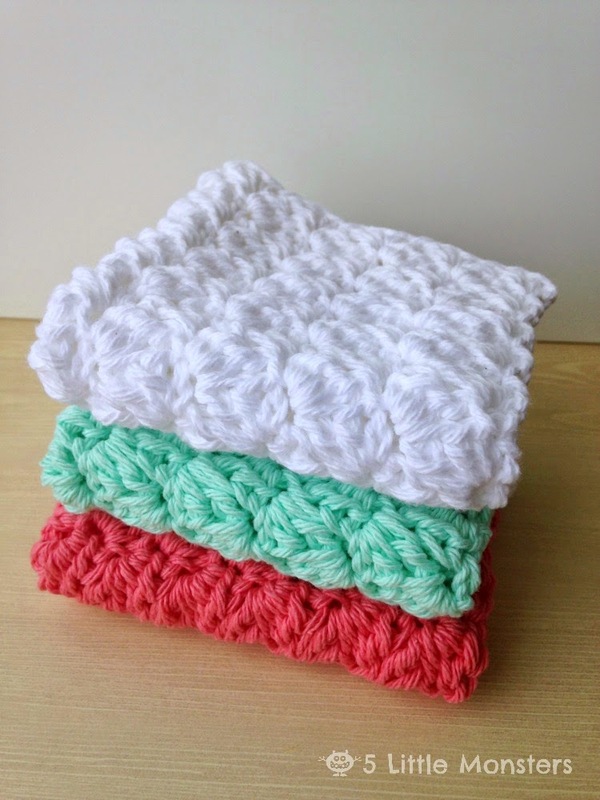 It uses a combination of double crochet, half double crochet, and single crochet. 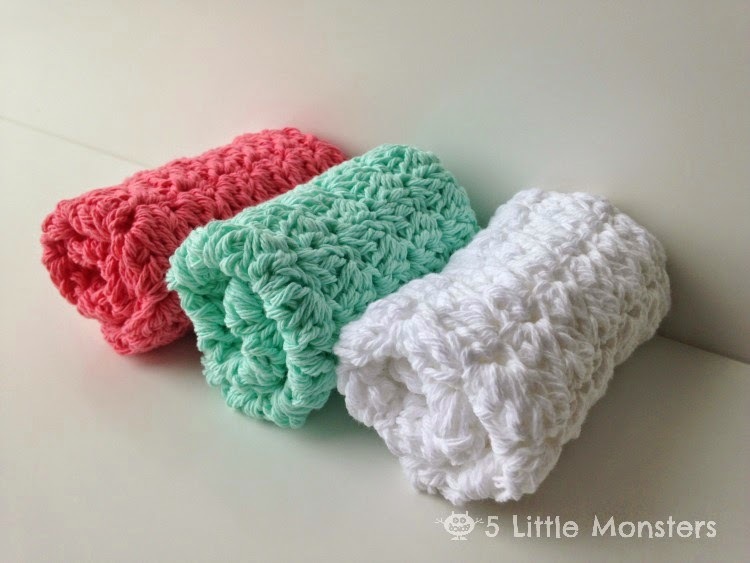 Again, I always use cotton yarn for my dishcloths. For these I used some white that I had in my stash, I am pretty sure it was Sugar 'n Cream but the label was long gone, it was from a big cone that I got a long time ago. The other two colors were Peaches & Cream yarn that I picked up at Walmart, mint and iced strawberry. Like I said, this is probably my favorite dishcloth pattern, I love the texture and look of it. I hope you enjoy it too. Dishcloths are so fun to make. What a great idea for a gift! What a great gift idea! I love a quick, chunky stitch. So if I want to make it a little bigger I just keep adding 3s and then a+2 at the end? So 3,6,9,12 chains then add 2 more. Another great pattern, again thank you for sharing! tem fotos q ensina ou vídeos? I love these dishcloths! I have been using them for months. I also made a couple, hand sewed them together and added a border of double crochet around the top. Then I crocheted a strap and it made a darling purse for my daughter. :) I love how this stitch is easy to do, pretty, fairly tight, and also still slightly feminine. Thanks for the great pattern. I haven't made any in awhile, this looks like a nice stitch. I used to make ones that started in the corner and worked diagonally. I love this pattern , thank you so very much ! I will use this often . I am a novice crocheter and I do not understand how row 2 is to be ended. Could you please explain it more clear to a new crocheter? Thank you so much for a great pattern! I really am enjoying making them, and giving them to my sisters and friends. The texture is just right. Quick and easy! My kind of pattern!! After Doing your (sc, hdc, dc) across in row 2, and you are to the end, if you can kinda pull the previous row of (sc, hdc, dc) apart slightly you'll be able to see the sc from row one. This is the exact hole to stitch the sc to end row 2. At least this is what works for me. Hope that helps you out. Nice simple pattern that works up quick.